She’s running against a former fighter pilot in a race that shouldn’t be tight. But McSally has picked up ground since and is now ahead by some reports after Sinema’s background has all come tumbling out. 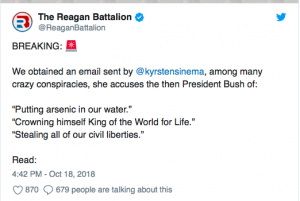 A newly released email sent by Arizona Democratic Senate candidate Kyrsten Sinema in 2002 accuses former President George W. Bush of various malevolent schemes. The email appears to be an invitation to a protest of Bush’s policies. “Meet at Patriot Square Park at 3pm (tentative time), then march to the downtown Civic Center Plaza, where we’ll protest Bush’s well…. pretty much everything the man does is worthy of protest, s [sic] you can pick from the following,” the email reads.